Chancellors, vice chancellors, rectors and university presidents representing all regions of the world were actively contributing to the programme as presenters and in the sophisticated discussions during the Triennial. Top-ranking participants included Aleksandre Jejelava, Vice Prime Minister of Georgia and Minister of Education and Science, as well as representatives from the United Nations and the European Union. Both Nations Secretary-General -António Manuel de Oliveira Guterres as well Johannes Hahn, EU Commissioner, sent video messages to all the participants. Paul Rübig, Chairman of the Scientific Committee of the European Parliament, addressed the Triennial participants during the Gala Dinner at the Hofburg. Ramu Damodaran, United Nations Academic Impact Initiative Chief, held a keynote speech on “Who makes an academic impact?”, which marked the conclusion of both conferences and stimulated joint discussions on current topics in higher education amongst university presidents and researchers. Together with the presidents conference, the Young Scientists conference – the „little sister“ of the Triennial conference – with a focus on ”Sustainability“ was held at Hofburg, attracting participants from all over the world, such as students from the ASPIRE organization in Japan. From New York and Yokohama to Vienna. 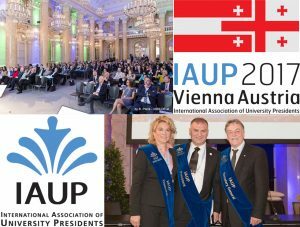 The IAUP XVIII Triennial Conference was successfully held in Vienna, Austria on July 5-8, 2017. More than 300 participants from 46 nations, 138 different universities and research institutes gathered in the most important event of our association, which is scheduled only once in three years. This marked the first time that a Triennial conference was held in Austria. This year’s Triennial conference put a special focus on innovative technologies for learning and teaching, the use of simulation in knowledge transfer and industry expectations towards the university of the future.